Dear leaders of our Unification Community, respected elders, UPA cadets, CARP members from Korea and around the world, good morning. I would like to thank everyone who made the long journey to be here. And I am sorry that, due to prior commitments which could not be re-scheduled, I cannot be with you on this memorable occasion. At the outset, I would like to sincerely congratulate Rev. Kwon In-soung on his appointment as the new World-CARP president. This is a very important providential mission and responsibility. Following True Father’s Seonghwa, nearly three years ago, True Mother has constantly emphasized the importance of raising leaders who will educate, nurture and raise up the next generation to carry our movement forward as we work to fulfill the ideal of Cheonilguk. I vividly remember True Mother’s tearful message at the time when she allocated the funds from the sale of True Father’s helicopter to the Wonmo Pyeongae Foundation for the sake of raising the next generation. Throughout their ministry True Parents have always placed the highest priority on the education of our youth, on all levels and in all fields of academia, so they could be empowered to become world-class leaders who transform our world in accordance with God’s Will. True Parents’ love for the younger generations is eternal, unchanging, and absolute. They know that our young people are the future and the hope of the Unification Movement. This is why CARP is so important. I can say without any exaggeration that the development of the Unification Movement went hand in hand with that of CARP. When True Parents were fighting the rising tide of Communism, CARP students stood on the frontline with True Parents. University campuses are where the hearts and minds of young people are shaped in decisive ways. However, we know that there are many aspects of the world’s educational system that are not consistent with the ideals of love, life and lineage that we know to be true. This is why CARP is so necessary. Therefore, let us work to develop CARP and expand the heartistic culture of true love and the powerful tradition of living for the sake of all humankind. Now we are currently living in a world filled with chaos, destruction, confusion, and conflict. The plague of communism that was the central challenge during the Cold War era is paling in comparison to the threats to all forms of life on this planet. We are witnessing the rapid depletion and irresponsible consumption of the precious resources of the earth. Hundreds and thousands of our human family members are devastated and dying due to natural disasters. Climate change is evidenced in record-breaking heat waves, super storms, mass drought, super bugs and super viruses; our oceans, plant-life, and all life are threatened as we continue to ignore our responsibility as stewards of Heavenly Parent’s precious and miraculous creation. This is an urgent crisis. However, rather than putting our hearts and minds together in unity to solve global issues, the human family is divided, quarrelling over sacred texts and doctrines, or over social and political ideologies. In the process we are losing sight of the most sacred gifts of all, life itself, true love and lineage. We have forgotten that we are one family under our Heavenly Parent. We have ignored, misunderstood or distorted the sacred guidance from heaven over millenia, failing even to listen to our own conscience. The quest for power has taken precedence over the ideal of true love. As such, we are at constant war and grasping for material gains, even at times killing our brothers and sisters, while forgetting that we are all one human family. There is only one path for the world, as True Mother stated at the UN, we cannot achieve lasting peace or solve global problems without connecting to our Heavenly Parent and True Parents. Without that foundation our efforts will be in vain. When we lose our origin, our legacy, our true conscience, we cannot provide a coherent answer to the most fundamental questions of all; questions such as “What is the ultimate origin of life and this precious, amazing universe?”, “Why am I here and what is my purpose in life?”, “What is the right way to live?” The True Parents’ words provide the answers to these questions. Without understanding True Parents, the world is lost in confusion regarding what is right or wrong; as a result, a culture of self-centeredness dominates our world and threatens our future. That is why we are eternally grateful that, during these turbulent times, we have True Parents. True Parents are guiding us along the path of righteousness, through their words and their exemplary life. May we, as their filial sons and daughters, honor that holy legacy and bring this truth to all 7 billion brothers and sisters on this planet. Let us no longer wage WAR against our confused brothers and sisters. Let us fulfill this ideal. There is no better time than now! Let us put all of our minds and hearts to this task. Let us utilize innovative technology, the best minds of academia, and the power of the youth to bring peace, love, and prosperity to humankind and our global home. I hope our younger leaders can pioneer a new generation of universally conscious, sincerely good, genuinely loving, innovative and sustainable leaders. A good leader is not simply someone who has position, power or authority to rule over others. A true leader is a person who is in touch with their true conscience; someone who develops and cultivates their conscience, centered on Heavenly Parent’s truth; someone who seeks to serve all members of our human family. True Parents have appointed Rev. 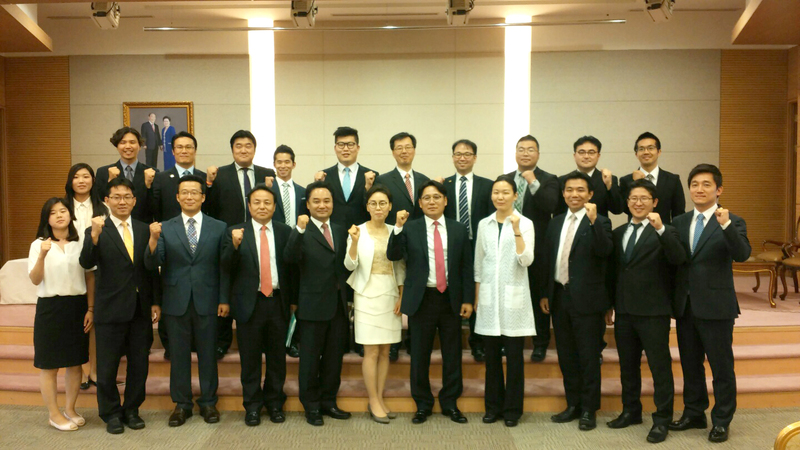 Kwon In-soung as the new president of World CARP. I pray and hope that under his leadership CARP will usher in a new age of heavenly victory for our Heavenly Parent and our True Parents. I know that as long as the youth of the Unification Movement unite completely with True Parents’ word and truth, the Unification Community will reach a new golden age centering on CARP. I would like to once more congratulate Rev. Kwon on his appointment and I pray that as CARP begins a new chapter of its history, the blessings of the Heavenly Parent and True Parents may always be with CARP.